There are moments in photography when you need to get up close and personal—without getting up close and personal. This is where the power of modern super-zooms comes in. My latest guide: the 6 best superzoom cameras available right now. I’ve done a lot of research, so there’s something here to please all expectations & budgets. All the usual makes are here, but some of the picks may surprise you. Keep reading to see if a superzoom can add something to your photography that modern DSLR or mirrorless cameras cannot. These aptly named superzoom cameras have incredible zoom ratios. Some models get to 83X, yet still deliver on the quality front. You can even expect rapid burst rates in the neighborhood of 5–10 fps. Some models have huge sensors that are not typical of popular bridge cameras. These are likely to have 10–25X zoom lenses with an image quality that’s equal to a decent DSLR. A superzoom camera can look and feel like a modern DSLR. There are also compact versions that are pocketable and portable. I’ve included models from both categories in this guide. The superzoom target audience is quite small compared to point-and-shoot compacts and DSLR users. Photographers still demand high image quality, creative controls, and capable low-light photography performance. First up is the Nikon COOLPIX P900, and what a great place to start. This puppy has an incredible 83x optical zoom. It’s perfect for wildlife, Astro, travel, and anything else that needs its zoom capability. The COOLPIX P900 is a great looking superzoom camera with a nice feel to it, and that’s always a bonus. At 32 ounces, it doesn’t have the lightest body, but then the P900 does pack a lot in. This beauty checks many boxes. You can shoot from wide-angle to telephoto with lots of supporting features. The built-ins include image stabilization, flash, WiFi, EVF, and a Stereo mic w/ mono speaker. The articulating screen is another major plus point. So are face detection-focusing and the selfie-friendly LCD screen. The battery life is decent, powering around 360 shots in ideal conditions. I found this amazing camera ideal for street photography, sports, action, and wildlife in particular. My main criticism is that it’s a tad slow at the telephoto end—no thanks to the f6.5 aperture. Now, let’s see what others think of the Nikon COOLPIX P900 digital superzoom. 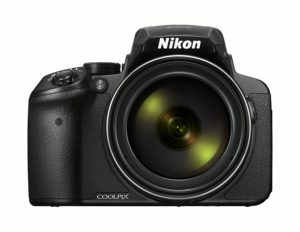 The Nikon COOLPIX P900 has been around since 2015, so there’s no shortage of user reviews. To say the least, it’s a popular superzoom camera with over 90% positive feedback from real users. Plenty of reviewers are happy to show off their work too, especially wildlife and astrophotography. Photographers seem to appreciate how the absence of a mirror reduces camera shake. Image clarity gets a lot of mention, with good reports for the wide and the telephoto ends. The flip-out screen is another popular feature and not something all superzoom cameras offer. There are a few complaints regarding how the AF slows down at the 2000mm telephoto. Although that can be a frustration, it’s not a major surprise, especially when light levels fall. Many reviewers wished the P900 supported the RAW file format. Overall, though, people seem more than happy with their choice of superzoom. Nothing else matters without superb image quality. The good news here is that image clarity is one of the most talked about advantages of the COOLPIX P900. The ease of taking photos and filming DSLR-quality video are other key factors. Using the EVF or swiveling vari-angle display makes composing shots a breeze with this camera. Sometimes manual is preferable over automatic & semi-automatic shooting modes. Well, the COOLPIX P900 has full manual exposure control. It sports manual focusing, as well. Other great features are the connectivity options, video resolution, and 1/4000s shutter speed. There’s also 7.0fps continuous shooting, time-lapse Recording, AE bracketing, and remote control. The list could go on, but this is an overview of the most popular attractions of the Nikon COOLPIX P900. Add to this the good looks and easy handling, and it’s a winning product. There is some noticeable shutter trip delay, especially when shooting at maximum resolution. The slowness is particularly frustrating when you need fast recovery times between shots. The smallish 16MP CMOS 1 2.3 sensor can’t offer the same dynamic range as a larger sensor. It’s less impressive in low light situations, and it produces more noise than cameras with bigger sensors. Don’t be too put off by the sensor size, though. Overall image quality and lens performance are the camera’s major advantages. It may not be as good as a larger sensor, but it’s still pretty darn good. Remember, the P900’s smaller sensor helps to keep the camera and its lens more compact. The Panasonic Lumix FZ80 launched back in 2017. That makes it one of the newer super zooms on the market. It packs a lot of value into its budget camera package, but it’s not going to sing to everyone. This camera doesn’t have the same zoom capability as the previous pick, but don’t stop reading just yet. It still has an insane 60X zoom capability and a wider-angle lens. At less than $400 (at the time of writing), it’s an affordable and capable choice. It looks cool, feels nice in the hands, and offers many great features. These include 4K UHD video and photo modes. There isn’t an articulating screen, but the LCD display is touchscreen. We’re so used to touchscreen technology in everyday life now, so it’s a welcome feature for most photographers. My guess is that the RAW format support will clinch the deal for perfectionists who don’t care for compression. The Panasonic FZ80 includes built-in Wi-Fi, but it doesn’t have NFC connectivity. Other built-ins include the electronic viewfinder and flash. There’s also a mono speaker, but this model doesn’t have a built-in microphone. There aren’t any connections to add an external mic either. I think it’s a truly great camera, despite a few absent features. 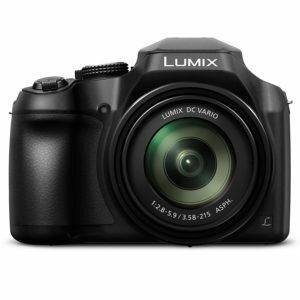 The Panasonic Lumix DMC-FZ80 is a top selling superzoom for the gizmo manufacturing giant. With so many sales comes scores of reviews, and this beauty gets plenty of praise from owners. Another good sign of the DMC-FZ80’s popularity is the amount of uploaded photo samples. There are two reasons why owners post photos: to show off, or to highlight faults. In this case, it’s the former. The first thing you’ll notice when you research this camera: the length of user-submitted reviews. Few people take the time to write detailed feedback unless they’re passionate about a product. Some of the comments for the Lumix DMC-FZ80 are the length of full-fledged articles. It’s certainly a popular choice for wildlife & especially bird photography. I’d say the Panasonic Lumix FZ80 is one of the most talked about superzoom cameras I’ve come across—in a good way. Real users let you know all that’s good about the Panasonic Lumix FZ80. I’ll highlight the best points here and a few others to boot, starting with the camera’s weight. One of the main attractions of a camera like this is versatility. You get lots of DSLR capability without a camera backpack full of extras. And at just 22 ounces, it’s easy and comfortable to carry, too. The ultra-fast LUMIX DFD focusing system and 49 focus points are well worth a mention. Fast and accurate focusing are key selling points for any camera, and this one passes with flying colors. The in-camera stabilization works well, albeit a little noisy at times. The noise is a minor gripe all things considered. For video, though, I still recommend a tripod to guarantee steady footage. The fixed 3-inch touchscreen LCD display is a popular feature. It’s especially welcome among less experienced & beginner photographers looking for a starter camera. Having a fast f/2.8 20mm, wide-angle lens up to 1200mm telephoto adds to the appeal. The camera’s long battery life and its ability to shoot at 10.0fps are no small details, either. For manual support, there’s manual focusing and manual exposure control. On the quality front, we have an 18.0MP high-resolution sensor, 4K video, 8MP stills, and RAW shooting capability. The FZ80’s face detection focusing is a great feature that helps improve people portraiture. Creative shutterbugs will also appreciate the flash shoe for on-or-off-camera flash photography. A couple of other highlights include the built-in WiFi and smartphone remote control. It all sounds too good to be true, but there are a few downsides as you’re about to discover. Manual controls are among the Lumix FZ80’s main attractions, but they’re far from perfect. They’re not what you might call ‘intuitive’, which means they can take some time to figure out. My advice is to take your time and learn about the manual functions. There are creative control options with manual photography that you can’t always achieve with automation. Low-light shooting with the Panasonic Lumix can be a challenge. It can take a while to focus, especially at the telephoto end. Taking photos in challenging light gets easier with experience. The absence of a flip-screen means less creative composure opportunities. A fully articulating screen would have provided extra flexibility to an already versatile tool. The Canon PowerShot G3 has been around since June 2015. It continues to sell well among its target audience. The G3 is not as affordable as the first two picks, so let’s see if it’s worth the extra. It’s the perfect compact camera for photographers who want something different—yet similar. By that, I mean a smaller, lighter camera that has like-features as a heavier, bulkier DSLR. This camera seems to meet the expectations of most people who own one. There are very few complaints about image quality, and that’s more than half its appeal. You’ll love Canon’s PowerShot range if you like their compact cameras. The G3 X is extra special. It has a long zoom range, a tilting LCD screen, and an external flash hot shoe. I love the tilting touchscreen too, but it does have restrictions. Importantly: it doesn’t tilt out to the side. The PowerShot G3 X has a few notable built-in features. There’s the built-in flash, stereo microphone, and a mono speaker. As an optional extra, there’s the built-in electronic viewfinder. So, is it worth the higher price tag? Keep reading before you decide. 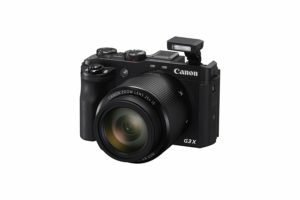 Reviews for the Canon PowerShot G3 X are mostly favorable. Reviewers often compare the G3 X to the Sony Cybershot DSC-RX10 and Panasonic Lumix DMC-FZ1000. Most user feedback for this camera tends to be from more serious amateurs and prosumers. 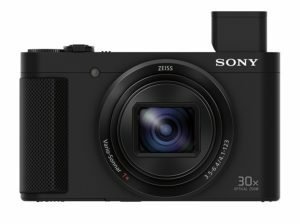 It’s lighter and smaller than both the RX10 and FZ1000, and its 24-600mm optical zoom range is longer. It’s a particularly popular superzoom for travel photography because of the above. Its main attraction is that it’s a great lightweight alternative to the heavier, more cumbersome digital-SLRs. Canon’s PowerShot G3X is a good choice for those who focus on stills photography over video. It’s also a popular upgrade for people ready to move on from a regular, point-and-shoot compact camera. Some reviewers comment on the absence of an Electronic Viewfinder (EVF). But there’s a Canon EVF-DC1 Electronic Viewfinder available as an optional extra for those who want the feature. The 20.2MP 1″ CMOS sensor is at least four times the size of those on typical compact cameras. The bigger sensor means crisper images, less noise, and beautiful bokeh. The optical performance and image quality is impressive for a superzoom in its class. This includes image capture at low and high ISO settings. The images are better still when using RAW files. The 3.2″ 1.62M-dot-tilting touchscreen dominates the rear of the camera. This amazing high-resolution display is a major attraction with its 180° upwards and 45° downwards ability. The screen would have been even better if it was fully articulating. Still, there are always compromises, especially with superzooms that boast ultra-compact designs. The rugged build and neat body of the PowerShot G3 X make it easy to carry and handle. It may not be the lightest of all superzooms, but there are much heavier models out there. There are many great reasons to consider the PowerShot G3X. The optical zoom range gives a fast f/2.8 24mm at the wide-angle end and 600mm telephoto. Plenty of zoom scope there. The external microphone port, headphone port, and ND filter will check boxes for videographers. And the camera’s built-in environmental sealing will certainly please all-weather photographers. For creative types, there’s full manual exposure control, manual focus, and time-lapse recording. The image stabilization, AE bracketing, and the RAW shooting options help to produce quality images. The PowerShot G3X has built-in Wi-Fi, NFC connectivity, and smartphone remote control. And for storage, it supports UHS-I (Ultra High Speed) memory cards. The missing built-in EVF is a disappointment considering the price of this camera. You can get the EVF-DC1 Electronic Viewfinder as an optional extra, but that’s not the point. There are some complaints that the focusing with the Canon PowerShot G3 X is slow. I wouldn’t say it’s slow, per se—it’s just not as fast as other quality superzooms. Some argue that the camera is heavy, but that depends what you compare it to. Its heft sits somewhere in the middle of the picks on this page. There are lighter options if weight’s an issue. The f/5.6 aperture makes the lens quite slow at the telephoto end. In photography terms, F/5.6 is not that slow for 600mm. Those who need faster lenses can always compromise with a lesser focal length. Photographers who appreciate Sony Cyber-shots will love the DSC-HX80 30X compact. The first thing that caught my eye—literally—was the unique electronic pop-up viewfinder with its 100% coverage. The 30x optical zoom is equivalent to 24mm wide to 720mm telephoto, so there’s plenty of range. And the camera’s amazing 5-axis image-stabilization feature ensures better image sharpness. I’d say this is the perfect pocketable travel zoom for the more serious amateur. It would also have made a significant backup camera for semi-pro and professional photographers if it had a faster lens. It’s not as feature-packed or as versatile as the Canon PowerShot G3 X above. But then it’s less than half the price of the Canon, so we can’t expect it to compete on every level. The HX80 has a few decent built-in features. These include WiFi, electronic viewfinder, flash, built-in stereo microphone, and a mono speaker. The Sony Cyber-shot DSC-HX80 is a popular choice of superzoom for all kinds of reasons. It falls short on certain features when compared to some models in this guide, but it still has plenty of fans. Reviewers talk fondly of what the camera offers more than what it lacks. The semi-tiltable flash is a big hit, as is the pop-up viewfinder, and the quick customizable menus. Social media buffs love the selfie-friendly 180-degree monitor and WIFI/NFC connectivity. Yes, the Cyber-shot DSC-HX80 is the most compact, lightweight, and pocketable superzoom in this guide. Many of the reviewers praise the camera’s easy handling, image quality, and versatility. The value for money aspect helps to tie in all the above to make this a great amateur’s choice. The fiddly popup flash annoys some people. It functions fine, but you have to remember to open it when you need flash. Oh well, at least no one’s wasting valuable film by forgetting. The Cyber-shot DSC-HX80 weighs 8.6 ounces, which makes it the world’s smallest and lightest superzoom. This puppy should make the shortlist if you’re looking for an ideal travel mate. Don’t let the smallness of this camera deter you. Its 18MP 1 2.3 BSI-CMOS image sensor and BIONZ X image processor deliver image quality with very little grain and high clarity. The Sony OLED Tru-Finder is a joy to use. It provides everything you could hope for in a retractable viewfinder. It has sharp contrast, it’s bright, and it displays all the camera’s most important settings. The memory function and customizable exposure settings appeal to many photographers. The seven customizable buttons include a single function button that can recall 12 regularly used functions. The 5-axis image stabilization, face detection focusing, panorama shooting, and AE bracketing also need a mention. Connectivity includes remote smartphone control, built-in WiFi, and NFC connectivity. Alas, the Cyber-shot DSC-HX80 is slow at both ends. The wide-angle 24mm is F3.5 and the 720mm telephoto F6.4. This will be a major or minor issue depending on the photographer’s expectations. There’s not a RAW shooting option, either. The camera’s video isn’t bad, though it’s not 4K. But then this is a photographer’s superzoom rather than a tool for videographers—in my opinion. A touchscreen would also be nice, but that’s a minor disadvantage. Other absent features include an external flash shoe, no manual focusing, and no weather sealing of any kind. These shortcomings are what help to keep this otherwise capable little camera affordable. This particular Sony superzoom is not right for you if you absolutely need any of its missing features. My penultimate pick is the beautiful Panasonic LUMIX FZ1000. Panasonic first introduced this 4K point-and-shoot superzoom camera in the summer of 2014. It’s been popular ever since. You will read that it’s a tad bulky, but it met my hands like a well-tailored glove. I can see how it may prove cumbersome for smaller hands, though. This camera is not as ‘super-zoom’ as others on this page, but it’s not bad. Skip this review if you want a mega-zoom focal range. Stay where you are if a wide-to-moderate telephoto suits your needs. You can expect superb image quality throughout the zoom range. The stabilization does an amazing job at steadying, and the camera wouldn’t have made these rankings without it. The built-in features include a popup flash, WiFi, and electronic viewfinder. On the audio side, there’s the built-in stereo microphone and mono speaker. External mics and flash units are optional extras. 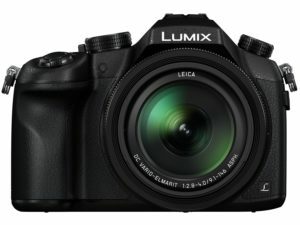 The Panasonic LUMIX FZ1000 is another feature-packed bestselling superzoom. It’s an excellent choice for photographers who want a camera where simplicity meets versatility. Many who own the FZ1000 wanted a DSLR-style camera without the heft and extra lenses. Reviewers praise this model for its sensor size, zoom range, and its plethora of control options. Those who have experienced the FZ1000 and the FZ300 tend to prefer the former. It’s also preferred over many entry-level DSLRs. The effective optical image stabilization gets it another brownie point. I liked the many comparisons in user reviews (you’ll notice this trend if/when you research the model, yourself). There’s plenty of feedback for the LUMIX FZ1000 from folks who can honestly compare it to other models—bridge cameras and DSLRs. It might not be a “perfect” camera—there’s no such thing. But it certainly seems to be a perfect compromise, or an ideal alternative, to the competition. No one ever complains that a camera is ‘too easy’ to use or that the arrangement of controls is ‘too convenient.’ Well, the easy interface and simple menus are part of the FZ1000’s main appeal. Overall, image quality is more than pleasing. This hybrid camera sports a quality Leica zoom lens, 4K video, and large 1″ 20MP CMOS sensor. The results are noticeably better than 1/2.3″ bridge cameras. The FZ1000 has inbuilt optical stabilization (OIS), but not all stabilization systems are equal. This is 5-axis, and it does a fantastic job at steadying handheld shots. It’s one of the reasons for the model’s success. The camera also has a fast startup time. You can appreciate the speed when you need to grab a shot at a moment’s notice. The camera should go from OFF–ON–ZOOM–FOCUS in less than a second. The list of highlights for this 16X optical zoom camera is as long as your arm. The FZ1000 includes 2359k dot viewfinder resolution and an articulating screen. Perfectionists appreciate the electronic built-in viewfinder, external flash shoe, and RAW shooting. People-photographers love the 49 focus points, face detection focusing, and good low light ISO. Budding videographers & YouTube vloggers looking for a camera should be happy, too. There’s the high 100mbps video bit rate, external mic port, and 120fps high-speed capture. The smartphone remote control feature is also worth a mention. The manual-focusing and manual-exposure are important features for creative control. And to finish off with the main highlights, there’s AE Bracketing, 1/4000s high shutter speed, and a long-ish battery life. At around 29.3 ounces (831g), the FZ1000 has a heavy body. And the 131mm thickness makes it quite big for a bridge camera in its class. It’s certainly not as portable as the Sony Cyber-Shot (above). The camera has an external microphone port, but there isn’t a headphone jack for monitoring audio. The absence of a built-in ND filter is another drawback for video in particular. The OIS and zoom are audible to the point where video picks up the sound. Despite these things, I think the camera still makes a good impression with most amateur videographers. A touchscreen and some weather sealing would have been welcome extras. It’s still a great value superzoom when you look at what it has over what’s missing. The final pick on my list of amazing superzoom cameras is the Nikon COOLPIX B700. It costs a little over $400 (at the time of writing) and seems well priced in its class. Nikon gave us the Coolpix B700 in early 2016, so it’s had plenty of time to prove itself. I score it well for features, portability, value for money, and its overall appeal. Note: The idea behind my reviews is to highlight any advantages AND disadvantages of a product. We all have different needs and expectations, so these reviews should help readers make better choices. My only major gripe—and it’s subjective—is the absence of an external flash shoe. If I had to pick one more, it would be that the lens is quite slow at both ends. Anything else would be nitpicking. The Nikon COOLPIX B700 has all my favorite built-in features like a stereo microphone and mono speaker. It also sports a built-in pop-up flash, WiFi, and electronic viewfinder (EVF). On that last point, I would have liked to see a rubber eyecup for this particular viewfinder. 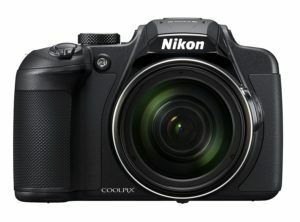 Most reviewers who bought the Nikon COOLPIX B700 didn’t consider its point-and-shoot charm. It is that, but its main appeal is nature and wildlife. Or, as Nikon puts it, “Get closer to what matters”. The sheer power of that 60x optical zoom is what lures people. No one can argue with the reach of the B700’s mega-telephoto lens. The main problem is stabilizing the lens at full telephoto. Some reviewers point out that the image stabilization is not always sufficient to fix camera shake at the telephoto end. This means a tripod or monopod is a good idea, especially in lower light situations. Reviewers are pleased with the quality of the glass, though. The beautiful bokeh, RAW file shooting, and handling get lots of approval. The size and weight of this superzoom also add to its popularity. There are many reasons why people choose the Nikon COOLPIX B700, but it’s not without a few faults. The image quality is amazing for a superzoom, enhanced still further when captured in RAW format. There are no complaints about the optics, but the camera does work better in brighter light. The bokeh (background blur) is very pleasing, and a nice surprise for a lens on a camera under $500. Shooting video and taking creative photos is easier with the fully articulated 3-inch LCD screen. The B700’s optical image stabilization (OIS) system is invaluable for handheld shots at lower shutter speeds. The OIS works well for most of the range, but it loses some effect at full telephoto end. The 60X optical zoom range of this compact lightweight bridge camera is nothing short of phenomenal. There’s 24mm at the wide-angle and it goes all the way up to 1440mm at the telephoto. Connectivity options include built-in WiFi, NFC & Bluetooth connectivity, and smartphone remote control. The camera’s manual options include manual focusing and manual exposure. Face detection focusing, time-lapse recording, and the 350-shot long battery life are a few more of the camera’s highlights. The B700 still has some disadvantages, despite its impressive features list. The COOLPIX B700 doesn’t have a touchscreen display. This absent feature isn’t unique to this camera, but it’s still sought-after. It’s not as preferred over the camera’s fully articulated screen, though. Alas, the 24–1440mm lens is slow at both ends. The f/6.5 telephoto has handheld issues in low light situations. The otherwise effective 5-axis hybrid vibration reduction (VR) won’t always do the job. The missing flash hot-shoe will disappoint those who like to be creative with light. And there’s not a battery charger with this superzoom, so you have to charge it in the camera’s body. The charging restriction is a pain if you want to charge a couple of batteries at the same time. It might be a good idea to invest in an external charger, and an extra battery (or two). 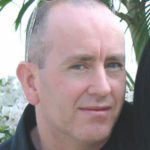 Andy Aitch is an expert in product research and review writing. He's passionate about delivering no-nonsense photography content to help people at all levels make better-informed buying decisions.